The rest of this post, too, is offered in the hope winter is receding in most of our rearview mirrors. One dawn last fall as I walked the dogs out at the old abandoned naval air station, I found an impromptu dump site – clothes, bed linens, cookware, toys. Someone’s life, spilled out inside a rusting cyclone fence’s gate. I made a mental note to notify someone about it and walked on with the dogs. The naval air station has that curious, scavengeous feel of any abandoned industrial site. It was a heavily restricted area for years (supporting nuclear warships) and as the navy departed we were given limited access on occasion. I remember driving to a meeting about the site’s future one blustery fall day over a decade ago, following the explicit directions to get to and from the hall – some areas still tidy and well-kept, others boarded-up and peeling. Immense looming buildings (Hollywood rents hangars on occasion for movie sets), sheets of corrugated steel flapping and screeching in the hard wind, a mixture of wild west ghost town and industrial desolation, now all renamed Alameda Point. We walk along the south shore, looking west across the bay to the San Francisco peninsula. At one end of our walk is a cluster of rusted white oil tanks, squat storage cylinders behind a fence. The skateboarders long ago broke into the gate, as they like using the asphalt berm for their raucous, suicidal stunts. It was there, inside the gate on the backside of the depot, I found the dumped household goods. Kitchenwares, bedsheets, clothes, women’s shoes, plastic toys. What story did the scratched teflon pans, ironing board and dolls tell? Across Alameda Point there is a now battered women’s facility. A coworker of mine volunteers there, and has told me that sometimes the abusive men find out where their ex’s are and come, trying to break in, so the women are moved. Was that part of this story? Or was it something else? Were angry roommates involved, an argument, a fight, and this was revenge? A theft? Was it the sorry remnants of someone newly homeless? There were endless sad possibilities. Over the first week the cookware disappeared – I notified my coworker, and wondered if someone from the women’s shelter found and recovered them. Then winter came, the storms, cold rains and hard winds, the mornings darker and darker until we are walking in starlight. The dump site became familiar, part of the walk’s scenery and the overall sense of abandonment. Few things look more forlorn than twisted shirts, pants and underwear, flattened by the rain and filthy with windblown dirt. I made mental notes to write about seeing someone’s privacy displayed and exposed this way, dozens of different false blogging starts, all as abandoned as the discarded goods, forgotten in my hustle home to feed dogs, to dress, to get to my commute and the workday. I felt sorry for some one or ones — people I didn’t even know. Toys meant a kid was involved, after all. In the unlikely event someone had dumped their stuff intentionally, it was still a pitiful thing to do. Over the winter more and more items disappeared until it seemed mostly just clothes and bed linens were left, and finally one morning a week ago I noticed someone had come and piled the rest off to one side, then covered it with one of the sheets. Skateboarders, tired of having their path fouled? This morning I finally brought the digital camera along. The days are getting longer now. Even on cloudy days the sun is up by the end of my workday walks, and on the weekends I go out a little later so we start in dawn twilight, enjoying the sunrise and full daylight, the dogs romping in the dusty fields, hunting jackrabbits and reading the bushes with their noses, sniffing out the canine news. For most of us, the days are getting longer and warmer. You may not all enjoy spring blossoms yet, but they will come. Your snows will melt, Robin, AOS, and pamplemousse. The rains will recede for us, LazyBuddhist. Stevo, soon you may not need IV coffee, the saps of spring fever will give your step a bounce, and Amuirin, I hope you soon enjoy sunshine within and without, too. Trucie, I hope you find someone to keep you warm in down under winter, and Azahar, judging by the happy sun on your blog home page, it seems you already enjoy endless Sevillian summer! Better than endless winter … I’ll never know whose personal life was spilled inside the depot gate last fall. Sometimes the winters within are the most endless ones, and I guess we should count ourselves lucky, as we grouse about winter without. I had more to write about this, but it’s lost now, perhaps left out in the cool, dimly lit air of our morning walk. 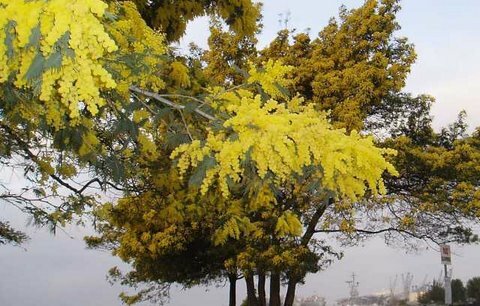 So here’s a last look at the blooming acacias. In the shot above the near blossoms were lit by the flash, this one is taken a bit farther away. And here’s one last hope: whoever lost her or his stuff last autumn, I hope spring comes for you, too. Oops, just a typo, aZ. Thank you for this evocative post. It makes me want to go out to Point Molate, another abandoned military post with beautiful views ripe for redevelopment, and go shoot some pictures of trees in bloom before the next wave of rains wash away their beautiful blossoms. LB: I can handle the rains — it’s the lengthening days, especially earlier mornings, that are my joy. But verstunken Congress has monkeyed with daylight savings time, “springing forward” a month too soon, in early March, so our mornings go back to darkness. Sigh — it’ll happen, eventually, it’ll happen. I hope your photo trip out to Point Molate goes well — maybe we’ll get to see some pictures? The trip to Point Molate was a bit of a bust. I forgot how fenced off the place is, plus security was stopping anyone who was stopped at the side of the road. Instead I opted to take a walk out at Point Isabel dog park and schmooze with the pooches. Post coming soon. Thank you for the ‘warm’ wishes, my friend. You’re right, Robin — and where would we be without hope!? We have one more month, pmousse, and as February hath only 29 days this go around, it’s now less than 30 days. But this time of year the days are getting longer at a good clip. We’ll hit that equinox soon, now — and once there, it’s six full months of more light than darkness. Now doesn’t winter make you savor the very notion all the more? A lovely article, and thanks for the link! Sure — and thanks for the great pix of the NAS. I walk along the rip-rap wall behind Encinal frequently, and I liked your story on how much of that rubble comes from the old Borax plant. They processed “20 mule team” Borax, years ago.